The Florida Supreme Court grappled with the meaning of the term "national party" and the boundary between law and politics Friday as it considered whether Ralph Nader should get a spot on the state's ballot as the Reform Party presidential candidate. Although not promising to rule by the end of the day, the court said it was aware of a Saturday deadline for mailing 25,000 ballots to overseas voters, most of them military personnel. 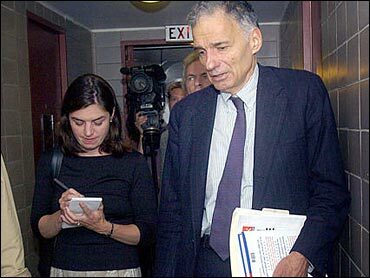 As the Green Party candidate in 2000, Nader attracted 97,000 Florida votes — and most Democrats and many Republicans agree that those votes cost Democrat Al Gore the presidency. President Bush won the state by 537 votes after three weeks of recounts and legal fighting — much of it before Florida's high court. This year, Nader has been on and off Florida's ballot several times over the last two weeks as lawsuits filed by the Florida Democratic Party and several individual voters challenged his certification as the Reform Party candidate. Nader is on the ballot in about three dozen states, mostly as an independent candidate. But his ballot position is being contested in the courts in about a dozen of those. In Florida, the Democrats' key legal challenge against Nader is their contention that the Reform Party is no longer bona fide national party and didn't nominate Nader in a national convention, but instead on a conference call. The Reform Party, which formed in 1995 out of Ross Perot's 1992 and 1996 presidential bids, has seen its membership decline amid infighting in recent years. Its national treasurer last month said the party had $18.18 in the bank. The Democrats' arguments are critical points because state law allows candidates for minor parties to avoid having to collect thousands of signatures to make the ballot if they're nominated by a national party in a national convention. A state judge last week ordered Secretary of State Glenda Hood, Florida's top elections official, to strike Nader from the ballot. Hood, who was appointed by Gov. Jeb Bush, complied. But when Hood appealed that order, an automatic suspension was triggered. So Nader was back on the ballot. On Wednesday, Circuit Judge Kevin Davey ordered Hood to take Nader off again and the state's high court agreed to take the case. A federal judge refused to intercede. Two dozen attorneys were on hand Friday when the justices tried to figure out the requirements of state law and whether the Reform Party still existed as a viable national minor party. Chief Justice Barbara Pariente said the court had a legal question to answer but that she was concerned with the subtext at play. "If we get ourselves too far into the politics, isn't the court then running afoul of ... a quintessential political controversy?" she asked Stephen Turner, one of the attorneys for Nader's opponents. Turner represents four voters: a Democrat and a Republican, an independent and a member of the Reform Party. "The statute's there," he answered. "The statute has meaning. It is a ballot access limitation and it must be applied in a meaningful way. And I think the evidence in this case is clear, by experts on both sides." Justice Harry Lee Anstead later asked the lawyer representing the Florida Reform Party as well as the Reform Party USA to point to the strongest evidence that the Reform Party was still viable. "The fact it is the fourth largest minor party in America today," D. Andrew Byrne said. "And wherever this court draws the line, if it draws the line where the lower court did, it will effectively exclude every minor party." Anstead asked lawyers to focus on the intent of state lawmakers in changing state law five years ago to let candidates of minor parties get on the ballot through a national party convention rather than a petition drive. "Aren't we left in sort of a political maze that perhaps the courts should not tread into in this situation where the Legislature has not given us more guidance and we have a constitutional background where we want really to give deference to participation in an election?" he asked Laurence Tribe, a Harvard Law professor who was representing the Florida Democratic Party and a handful of other individual voters. Pariente asked Tribe if lawmakers could have chosen to put no restrictions on ballot access. They could, he replied. But it could result in a ballot so big it makes the right to vote meaningless, he said. "It would produce a chaotic ballot worse than the butterfly," he said, referring to the Palm Beach County ballot made infamous in the 2000 presidential election. "Centipede ballots."